Dangote to rebuild Apapa Wharf Road, MoU signed - AutoReportNG "AutoReportNG-The No 1 Car Blog In Nigeria That You Can Trust - AutoReportNG"
The Minister of Power, Works and Housing, Mr Babatunde Fashola on Saturday signed a N4.34 Billion Memorandum of Understanding (MoU) with Dangote Group and other stakeholders for the rebuilding of Apapa Wharf Road. The road was handed over to the stakeholders for commencement of reconstruction works after the agreement was signed in Lagos. He said that the choice of the transporters to use road instead of rail for haulage increased gridlock, caused degeneration as well as well as hardship to residents of Apapa. The minister commended the “leadership role’’ of the stakeholders to solve the complex problems in Apapa and its environs. “As a result of all these unsavoury practices, we have reached a point of near total gridlock, it is difficult to move cargo in or out, difficult for residents to get home and this must stop,’’ he said. Fashola said that it took time to reach an agreement on the project because the stakeholders were putting up an effective design that would address the drainage problem because the area was water logged. “We have finished with the design, we now have a Bill of Quantity and the cost of the road is N4.34 billion to be funded and paid for by these three groups, Flour Mills of Nigeria, AG Dangote Construction Company Ltd and NPA,’’ he said. The minister said that although the parties were funding the project, the Federal Ministry of Power Works and Housing would supervise it through all the stages to ensure quality and compliance with standards. Fashola sought for the cooperation of all residents of Lagos and directed the Apapa Area Commander of the Nigerian Police Force, DSP My Nuru to apprehend reckless drivers who drive against traffic during the period of construction. He also appealed to Nuru to tackle all bureaucracies that would affect free flow of traffic while apprehending offenders. The Managing Director, Flour Mills of Nigeria, Mr Paul Gbededo said that Wharf Road was the “most important road in the entire country’’ which needed more attention. “This kind of road cannot be handled with levity,’’ he said. 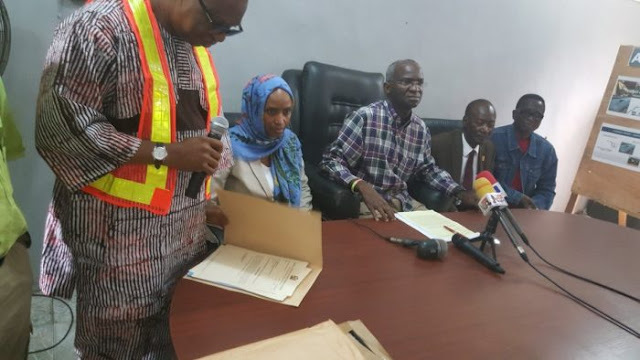 Responding to issues of lack of holding bays raised by transport unions, the Managing Director of NPA, Ms. Hadiza Usman said that government would support the private sector to drive the initiative to set up new ones. “We have received proposals on electronic management of holding bays, we are working through processes and we would soon conclude on that,’’ she said. She said that tank farms that do not have holding bays for their trucks would soon be sanctioned. Usman said that the NPA was also working on providing weigh bridges within the ports as well as enforce implementation in a few months to take care of problem of high axle load on the roads. Mr Joseph Makanjuola, the honorary Adviser to Dangote Group of Companies assured that the company would contribute its funding as part of its corporate Social responsibility and would still meet its tax obligations to government. The Managing Director of AG Dangote Construction Company Ltd, rigid pavement would be used for the two-kilometre road. He also assured that high quality materials that would withstand stress would be used. Representatives of truck owners, transport unions, maritime operators, business owners in Apapa were among stakeholders present at the ceremony.